Our Scholars at Work in Science! My 4th-8th grade scientists have been busy wrapping things up as we approach the winter break. My 4th graders experimented with different types of magnets and even built an electromagnet. They will be moving into a study of motion and will be engineering all sorts of fun moving things including a zipline. 5th graders have almost completely wrapped up their study of they earth as we used play dough to model plate tectonics and learn how mountains form. As a final presentation they researched volcanos of their choice from all over the world. They contructed some beautiful posters and 3-D models of Mt. Fuji, Vesuvius, and many of the power ones on the paradise of Hawaii! After break they will finish there study of earth with Earthquakes, then move onto a brand new book of Space. It promises to be out of this world! 6th graders finished up their books with a study of genetic engineering including GMOs and cloning. After break, much to my excitement, we will be starting anatomy and physiology which means dissections! 7th graders turned in some beautiful coin designs to wrap up their study of unit 2 which included redox reactions, percent composition and the amazing mole. When they return we will jump right into the glue that holds matter together…bonding! Finally my 8th graders finished physics strong with a tour of all things sound. It is one of my favorite units because sound is a personal experience. After winter break they will dive into biology for a deeper look at the biological processes that make us amazing machines. This will culminate in a dissection of a fetal pig! On the social learning front my students collected items for Hesed House shelter in Aurora, sent cards to military veterans in honor of the anniversary of Pearl Harbor, and made decorations for our holiday tree reminding us of the gifts that we have in our lives to be thankful for. Looking ahead all my 4th-8th grade students will begin to prepare for science fair in the spring. This exciting event showcases what the students are passionate about in the world of science and challenges them to be scientists and run their own experiments. Students are required to be prepared with a full lab report, a short presentation for the judges, and a presentation board. All the pieces required to have a strong shown are done in small chunks so it is doable for everyone! Our Soccer shots wanted to come and givea 15minute fun lessons to our Pre3 and Pre 4 students. Now we wait for our winter sessions to begin. We have begun the last month of the year, a month of celebrations and festivities. December is special as it bids adieu to the year 2016 and heralds a new year. The field trip to Cernan Earth and Space Center was enjoyable and knowledgeable. The exposure to geography in the classroom was visibly helpful for the children in understanding the interactive presentation of day and night sky, seasons and such. The history of Thanksgiving holiday was discussed and books were read to, with introduction to relevant vocabulary words such as Pilgrims and Indians. Children worked on making Cornucopias of fruit and vegetables. Thanksgiving lunch was a cherished feast with hot lunch, Indian and Pilgrim hats. Even before that, the food drive to the Lisle food pantry was a great success. Thank you all for your donations to the baskets. Kids enjoyed decorating the baskets and the sense of giving to the community. December Activities: Children are enjoying their work in the classrooms. They continue to practise the Practical Life skills such as scrubbing, patterning, folding, cutting etc. while working on the extensions of these works; for example, cutting a variety of borders with decorative scissors. Children had fun gathering pine cones, sorting them by size, extracting the pine nuts from them and painting the cones. As we approach the winter celebrations that are due on December 16, much focus is given to the song practice every day. Children are doing their best to put on a great show that day. Hope they do well and you have a nice time. Events of the month: Winter celebrations on Friday, Dec 16th. Location is Trinity Church. Holidays: School closed from Friday, Dec 23 to Sunday, Jan 8. School reopens on Monday, Jan 9th. Field Trip: No field trip in December. Winter gear: Please dress your child for winter weather in snow pants, boots, mittens and winter coats, so they can enjoy the snow while staying warm. Spell Check for Kindergartners: The pledge forms are due on Monday Dec 12th. The written spelling test is on Dec 13th. The funds pledged are due on Monday Dec 19. 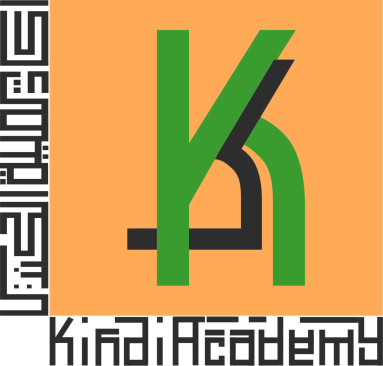 The spelling list for first graders is used for kindergartners too and is available on kindi website. Happy Holidays and Happy New Year 2017! ​Ms. Sujata, Ms. Hebba, Ms. Sravani, Ms. Faiza, Ms Ridhima, and Ms. Archana. In the Toddler Classroom, we try to appeal to the children's senses as much as possible by introducing materials that are natural, beautiful, interesting in taste, smell and touch. We do this by bringing cooking activities into the classroom. This is the capstone of practical life work and independence. We make pancakes, sweet potatoes, and a wide variety of delicious goodies that require mixing flour, cracking eggs, and some serious mixing by our toddlers! While we are cooking together, the children are very attentive and inquisitive. We introduce them to new terminology enhancing their vocabulary. They learn that certain items are ‘hot’ and follow social and sensory cues that reaffirm the pan is ‘too hot’ to touch. They love every moment of the process, and always enjoy special presentations and tutorials such as cutting fruits, making homemade play dough, arranging flowers, and creating sand paper letters. We have been able to put more practical life work out for the children to develop skills that indifferently prepare them for reading, writing and quantitative reasoning. Due to the frigid temperature that we have recently been experiencing, the gross motor activities have been mostly indoors. Movement and dancing to songs on the line, walking on the balance beams, bikes, and tunnel has been a lot of fun. We are also taking walks when the weather permits. Please send your child with waterproof snow pants, winter boots, gloves/mittens as we will need them daily. Our wonderful toddlers also put together a gift for our principle. Happy holidays, and stay warm! We had fun making food baskets for the less fortunate families in DuPage County. Thanks for your generous food and monetary donation. Our children thoroughly enjoyed decorating the baskets. They were very proud of their contribution. Kindi Academy was able to provide food baskets for twenty families in the DuPage County area!!!! he Thanksgiving Lunch was filled with yummy food and treats. We even had a new student join our class: Hamid Safvi ( Ms. Samiah's son)! 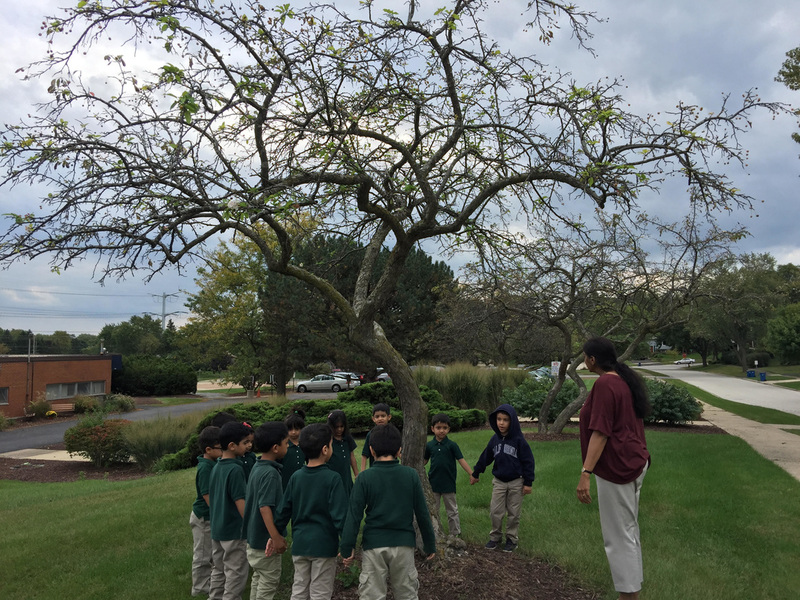 We enjoyed our November field trip to Mitchell Museum of the American Indian in Evanston. Our students were able to make many learning connections of what was being presented at the museum to the research they were doing at school on different Native American tribes. Our first year students have been working on Native American tribe research and presented their research to the second and third year students. In Botany and Zoology, they are working on Parts of a Root and Parts of an Amphibian. 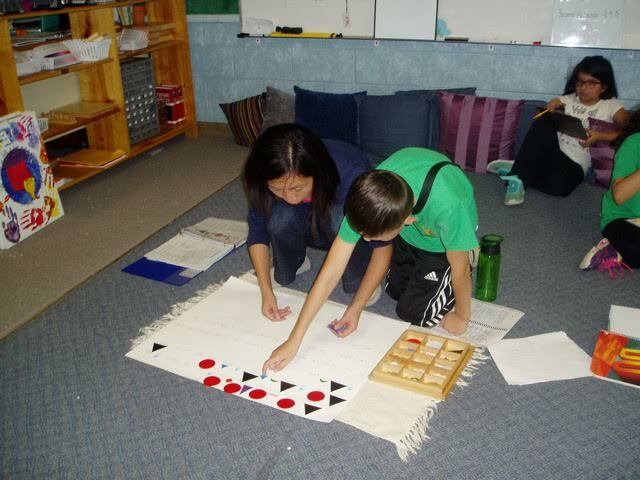 In Math, the students are using Stamp Game to solve dynamic addition and subtraction problems. In History and Geography, the students are working on Fundamental Needs of People-Shelter. This month, in Language, the students will be starting Noun study. The second year students worked on and presented dioramas for a Native American tribe of their choice. In Language, the second years are working on pronoun grammar boxes. We have started working on two digit divisor in Stamp Game Division, times tables and Checkerboard in Math. In History, the students are working on Holidays Around the World research. The third year students are busy finishing up their Timeline of Life and Characteristics of a Vertebrate note cards and timeline. In Language, they are working on sentence analysis. The third years are enjoying fractions and long division by using the Test Tube material. Also, the students are working on complementary and supplementary angles, area and perimeter and LCM in Math and Geometry. Our A.R. (Accelerated Reading) program is going on in full speed. The children are excited to read and take a short comprehension quiz at school about the book they have read. We already have many students winning prizes. Please encourage your child to read more at home and come take an A.R. quiz at school. Winter is upon us and we would like to remind parents to send their children with snow pants, snow boots, winter jackets, scarves, hats and gloves. Be sure to label your children’s belongings with his or her name. We suggest sending an extra pair of gloves or mittens to school with your child in the event a pair of mittens goes missing. Children who are not dressed appropriately for winter will not be permitted to play in the snow, but will be allowed to stay on the sidewalk instead. Arriving in school on time brings peace and harmony in a child’s day. Please allow an extra 15 minutes for the unforeseen circumstances that creep up in the morning. With the arrival of winter and snow days, please monitor the weather diligently the night before and plan ahead of time to leave home 15 minutes ahead of your original schedule. This will help your child in being well-prepared for line time and other classroom presentations. As always, your children are our priority. Please talk to us or set up a meeting if you have any concerns. Sometimes the children have difficulty understanding all the communication that takes place in the classroom, mainly because they listen to incomplete information. If you have any questions or concerns please make sure that you clarify it with the teachers. We would like to keep our communication wide open to satisfy your needs. The 6-9 Montessori Classroom staff would like to wish you and your family a very peaceful and safe winter break and a prosperous New Year! See you next year (2017)! This month in writing, students wrote a formal letter. Many chose to address this letter to Mr. Hatem, in hopes of opening the doors of communication on ways to improve Kindi Academy. Mr. Hatem was very responsive to our letters and wrote us a response quickly! The students were excited to see their hard work pay off and to have a voice at Kindi. Students have been excited to work on an independent research project these last few weeks. Each child chose a topic that fascinates him or her, then was given the choice on how they would like to present their knowledge to the class. It was great to see the students so interested in learning something new and sharing it with the class! We would like to introduce Mr. Corey! Mr. Corey will be working as an assistant in the Upper Elementary room for the second semester. He has a background in music education and we are excited to welcome him to our class! We hope you have a safe and happy holiday! See you in 2017! Middle School Social Studies classes have been hard at work wrapping up the quarter. In 7/8th Social Studies, we finished our unit on “Absolutism to Revolution”. We covered units regarding monarchies in Spain, England, France and Russia. Students also studied the Scientific Revolution and the Enlightenment period, with the unit wrapping up with the French Revolution. Students invented a time travel machine and traveled back to the time of the French Revolution. They also developed travel brochures for what a visitor might see if going back in time to France during Napoleon and the Revolution..
6th Social Studies on immigration. They wrote a persuasive essay about how immigration to the United States is viewed today. They also completed their study of the Gilded Age and the Progressive Movement. Students were given the choice to complete a Who’s Who book on important people from the time period, draw political cartoons from the time period, or make a historical scrapbook. They worked really hard and their final products were awesome! All students have been vigorously studying for midterm exams. They have worked so hard these first two quarters and am greatly looking forward to the two weeks off for winter break!! Our Spanish classes have been very busy preparing their culturally-rich songs for the winter celebration! They have also been working through many different themed units. Whether our students are learning clothing vocabulary, practicing numbers and counting, describing the size and color of various animals, or learning verbs and conjugation patterns, these students are enthusiastically embracing the new material and challenges presented to them! The starter of the chapter is "Cómo eres tú?" from which the students have been studying new vocabulary about personality traits. We have enjoyed learning adjectives by working in pairsto quiz each other on the learned material. We have continually worked in small groups in order for them to get comfortable with describing themselves as well as other's with the personality traits vocabulary. The activity has also consisted in talking about and describing. Due to the holiday season, students had a great time singing and dancing to the song "Los pastores corren a Belen". The upper levels have learned to work with reflexive verbs, and understand information about getting ready for an event and talking about daily routines. A puzzle was created with a different pattern on each part . The kindergarteners did an amazing job with the line drawing and creating their own patterns. The first graders learned the watercolor technique of wet on wet painting. Planets were painted by our 3rd grade for the play. They came out superb on stage! We learnt to draw penguins,reindeers,ever green trees and polar bears. Medium used was color pencil and pastels. Sufi inspired by Edgar Degas.she mirrored his young dancer. Medium:metal hanger, sheer leggings ,gesso( primer )and acrylic paints . Our students learned to use a hammer and nails .It was an amazing experience. They enjoyed every part of the project. ​In Islamic studies we finished with the upper elementary and middle school the seerah of our beloved Prophet in Makkah and learned about the congressional Salat. We are working on developing our vocabulary on terms related to our homes. How to define rooms and Furniture , and how to describe that. Also we were practicing for our winter celebration performance. All our students did an amazing job in practicing and rehearsing, salute for all.